We just added the latest issue of the The New York Researcher to our New York Genealogical and Biographical Society eLibrary. The Winter 2015 issue is full of essential reading for anyone with family members that have lived in New York City or New York State. The NYG&B; is the most authoritative source for New York State research - getting familiar with their organization will help you make leaps and bounds in your family history research. To view Winter 2015 issue of The New York Researcher, click here. Read the sections below for a rundown of the great articles in this issue. If you would like to browse other issues, visit our New York Researcher image browse page. You can also search by season and year to find a specific quarterly issue (for instance, "Spring 2015"). 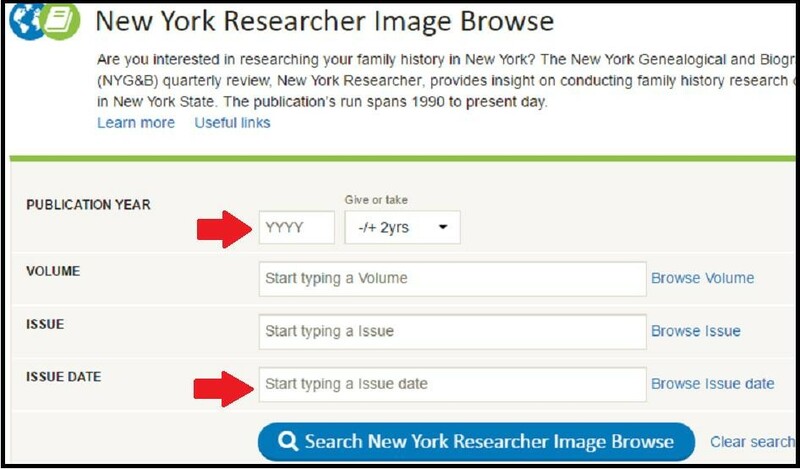 Enter any search term you're interested in in the "full text search" field to search all issues of the New York Researcher. Use the "full text search" field to search for any subject you're interested in. If it's related to New York State, chances are it's been written about! Probate records - records associated with the distribution of someone's estate - are extremely valuable to genealogists. They are contain information on the deceased's name, names of family members, in-laws, friends and associates, and details on their estate. New York Probate Records can be accessed via FamilySearch and are a little tricky to use successfully, but this two-part guide from NYG&B; will show you the way. Part 1 from the Fall 2015 issue focused on showing you how to examine "New York County" Wills 1665-1800, which contain probate records for far more than just New York County. Most of New York's early administrations and inventories are found on FamilySearch.org under Albany and New York counties, even though they are from all of the counties. Part 2 highlights a wealth of other probate records, including letters of administration, administration bonds, administration papers, inventories and more - all essential resources for early New York research. "I call it the most comprehensive collection in the English-speaking world of records pertaining to the administration of criminal justice." The New York City Municipal Archives are an absolute goldmine of genealogical information. New York Researcher editor Susan Miller sat down with the author of a forthcoming book, The New York City Municipal Archives: An Authorized Guide for Family Historians to talk about the amazing things found in the records there. Think about what interactions people have with the municipal government... each of these interactions produced records. Kenneth Cobb, the Archives Assistant Commissioner also joins the conversation. The two answer questions on the most valuable collections - including what Kenneth refers to as "the most comprehensive collection in the English-speaking world of records pertaining to the administration of criminal justice." They also speak of making unexpected discoveries, forthcoming digitization projects and more. 23andMe has recently shifted towards a more health-focused test. Their test now provides information on over 30 inheritable diseases. See NYG&B;'s take on what this may mean for the future direction of the company, and how it affects the test-taker more interested in a genealogical result. Resources for better understanding the science behind these changes are also provided. Two important developments have recently take place in the world of genetic genealogy. AncestryDNA has also made several recent changes, and genealogists are likely to be more pleased with these ones. See what shared centimorgans mean for interpreting DNA matches and how AncestryDNA's new algorithm may reduce false positive matches. Resources with reviews and explanations of the improvements are also provided. A general list of upcoming conferences a New York State researcher might be interested in attending.